We operate a network of nearly 200 customer service centers. To serve you better, we have recently opened and expanded a number of facilities across the largest 45 states and Canadian provinces. We are one of few providers who can effectively service the long-haul market, all the major regional markets, and the international market. We’ve invested heavily in service capabilities in our customers’ biggest markets – Chicago, LA, Dallas, Atlanta, Boston, Cleveland, and others. Yet this is the smaller part of the system-wide investments we continue to make. Reliable, high quality service is the cornerstone of value, and Central Transport’s product definitely delivers. Our on-time service is extremely dependable and our transit times are competitive. That’s why we provide a no-upcharge guaranteed next-day service in certain regions. Just within the last year, we’ve purchased over 1,500 new tractors and trailers (100% air-ride to protect your freight) for the industry’s most modern fleet, with an average age of two years. Brand new “pups” are now in service throughout our system to reduce damage and transit times. We have fine-tuned our Activity Center network to minimize handling and maximize speed and quality. We’ve invested millions in equipment and technology to move your freight (especially palletized freight) more efficiently and protect it from damage and loss, including the installation of loading bars and decking systems throughout our fleet. Central Transport’s approach to quality service is proactive. Each Activity Center has its own Quality Assurance executive. Our Process Engineering group ensures standardized practices system-wide and continuous improvement. This goes way beyond C-TPAT and many other programs for which we are also certified. Customers have recognized the value of this method and benefited from it. For example, Schneider Logistics recently named Central Transport as its “Carrier of the Year” for the third year in a row. Our most important investment and source of value to you is our company drivers. Due to an aggressive recruitment campaign and the highest pay scale in the industry, we have attracted the best drivers and given them the most technologically sophisticated tools to be optimally productive with. And they are delivering, on time and with an outstanding safety record. The combination of a highly-trained and motivated work force, clear performance standards, and process discipline has created a truly responsive, customer-focused culture throughout Central Transport. Interested in joining us? 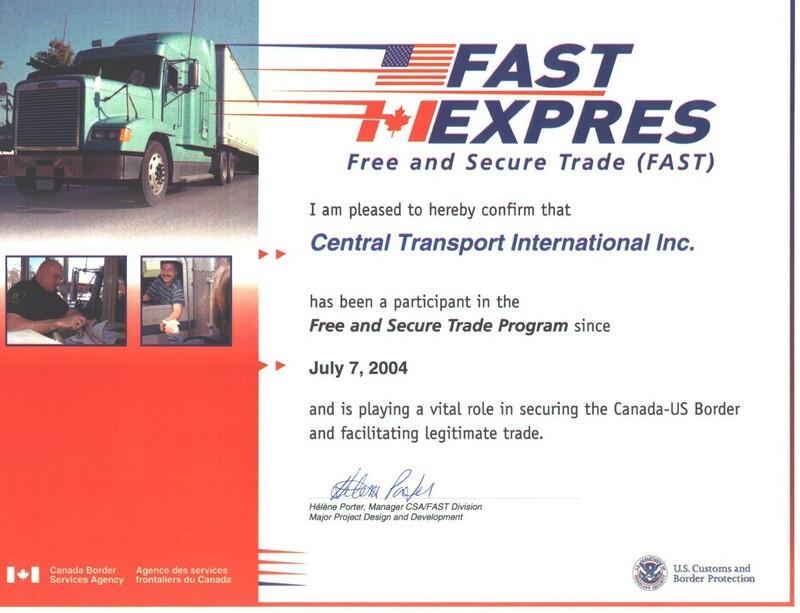 Click on: http://www.centraltransport.com/employment/contract.aspx. Our new enterprise computer system is entirely web-based and, in conjunction with the hand-held computers our drivers and docks use, runs on 100% real time data. It provides all the tracking tools we and our customers need to identify any potential problems early on and head them off. You can also be sure that you will always get correct and timely freight bills, which conveniently include a copy of your bill of lading and delivery receipt on the same document. Our focus on the customer’s needs and on creating value is also evident in our easy-to-use, comprehensive, and technologically-advanced support areas, such as this web site and our customer service center ((586) 467-1900). We further demonstrate our customer orientation through the latitude we give our service centers and sales executives to create customized solutions for our customers with special needs – for example, to streamline their supply chain by using Central Transport’s terminals as consolidation or distribution centers, or through our reverse logistics expertise, or by seamlessly tying in with our sister companies LINC, CTX, CSI, and Central Global for dedicated, warehousing, expedited, or international needs.